Our dye masters in Nepal have spent years creating an extensive palette of rich colors from local plant materials, and are able to match nearly any hue. Our dyes are derived from nature, with absolutely no chemicals! Only flowers, roots, leaves, tree bark, and nuts are used in our process. The result a beautiful, safe and sustainable rug for your home. Varying fiber content and pile height can also give your rug a distinctive look and is part of our custom design service. HEMP: Hemp, which grows wild near remote villages in Western Nepal, takes about a year to mature. Harvested at the end of the growing season when the plants are cut, the stalks are treated with organic material and sun dried over a period of two to three months. Creating yarn from hemp plants is a multi-step process performed entirely by hand. Our natural treatment of the yarns releases the beautiful fibers from the indigenous hemp plants. Local conditions such as the amount of rainfall also impact the end result, producing color variations that enhance the unique nature of our floor coverings. Hemp is indigenous to the Indian sub-continent region and grows naturally without the need for irrigation or cultivation. Since these fibers are also naturally resistant to pests, the impact on the environment is minimal. Available in three natural shades. CACTUS: Available in gold or gray, cactus rugs are popular in contemporary spaces. Skilled workers hand spin a beautifully strong and durable fiber. A member of the yucca family, cactus grows wild near remote villages in western Nepal without the need for irrigation or cultivation. Our indigenous cactus fibers are naturally resistant to pests, which means that our production methods have a minimal environmental impact. LINEN: Linen fibers are made from the flax plant, or Linum usitatissimum, which has been used in the weaving of textiles for thousands of years. We have reinterpreted this ancient fiber as a chic and durable expression of modern sustainability. Available in shades of ivory, ecru, tan or grey. CASHMERE: Cashmere is collected from cashmere goats in very high altitude areas of the Indian sub-continent. This highly prized fiber is spun by hand to produce yarn. Unbelievably luxurious, a cashmere rug will be a prized possession for many years to come and becomes both a story and piece of your life that can be passed on through your family's generations. Available in natural shades or any of our botanical dyes. Color matching is available upon request. WOOL: All of our wool comes from sheep that graze at over 14,000 feet in elevation, resulting in fibers that are 20% higher in lanolin. Our incredibly lanolin-rich wool makes rugs more naturally water and soil resistant than chemically treated rugs. The use of chemicals is non-traditional to the art of rug making and completely unnecessary. 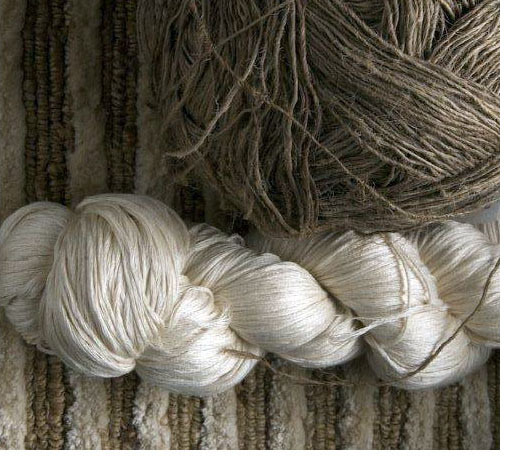 OF mohair fibers imparts luster to our rugs. felting capacity and can be easily tolerated by clients sensitive to wool. Mohair is available in natural or any of our botanical dye shades. NETTLE: Nettle possesses a rich sheen with a subtle reflective quality similar to silk. growing season. A strong cloth is used to remove thorns and the outer layer of stalk. to complete. Available in two natural shades.